We have developed two types of graphs to present complex data as clearly as possible. Motion charts add motion and many ways of illustrating the data for maximum flexibility. 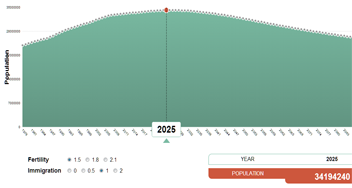 Interactive graphs allow different data sets to be viewed as alternative outcomes. If you have good, relevant data, we’d love to graph it! Choose different variable values and see how much the outcomes change. These are simple data sets which have been calibrated to, and reflect the output of, sophisticated models. 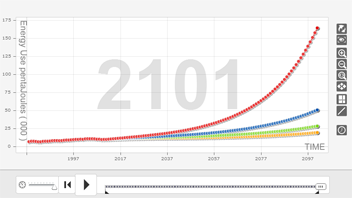 Very flexible presentation graphing allows you to show different trends over variable time windows, with many speeds and colours to place emphasis on different portions of the data. Presentations can include simple one line graphs or multiple datasets. Not only do these graphs display clearly the rise and fall of many of the world’s populations through history, they show the relationship of those populations to their two key resources: arable land and fresh water. See how these relationships change with different population growth assumptions over the coming century. Productive national policy formation must be based on relevant real world statistics. Simple dollar statistics measuring the size and growth rate of the commercial economy are of little use in representing the health of a nation or the direction in which it should go. Measuring in consumption units does not reflect future potential any more than looking in the rearview mirror can provide a reliable vision of the road ahead. A nation consists of the people and the land and the institutions which give structure to the society. The physical well-being of both the land and the people can be represented only by physical metrics rather than by printed fiat currency flows. As important as the integrity of the physical measurements, is the time horizon used for planning. The health of the nation depends on the decisions made generations ago. Assets per capita, debt of all kinds and the productivity of the population are all critical societal determinates but it takes decades for policy decisions to affect change. We must begin to measure in units that reflect the goals we are striving to achieve and make the goals attainable and sustainable.